Piero Fornasetti (born the November 10th, 1913 in Milan - died in the same city in October 1988) is a painter, designer, sculptor and Italian interior designer of the twentieth century, the creator of more than 11 000 pieces. In 1930, he studied drawing at the Academy of Fine Arts Brera, was expelled in 1932 for indiscipline and printed scarves exhibited his first in 1933 at the Milan Triennale (where he exhibited several years). In 1940, he met Gio Ponti, an architect and designer with whom he worked for years. From 1943 to 1946, Fornasetti was exiled in Switzerland, but he lived mostly in Milan. In 1970, he founded with friends the Galleria dei Bibliofili. Currently, Barnaba Fornasetti's son continues to design with the name of his father. 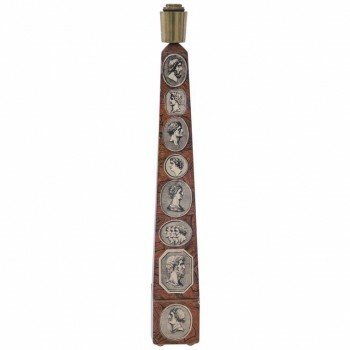 Piero Fornasetti, table lamp, silkscreened metal, Fornasetti production, production label under the base, circa 1960, Italy. 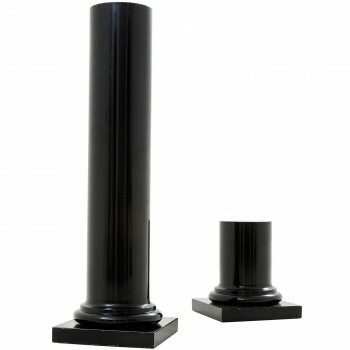 Measures: Height: 92 cm, diameter: 20 cm. Similar model: Barnaba Fornasetti, Mariuccia Casadi, Fornasetti, L'artista alchimista, la bottega fantastica, Electa, 2011, p., ill n°343. 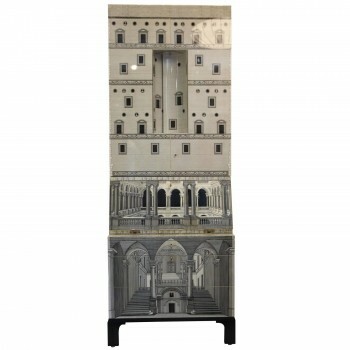 Piero Fornasetti (1913-1988), Cabinet "Trumeau Architettura," Barnaba Fornasetti edition, Lithograph on wood, Circa 2000, Italy. Measures: Height: 220 cm, width 80 cm, depth 41 cm. Piero Fornasetti (1913-1988), "Leopardo" pair of sideboard. Lithographic transfer printed wood, brass and painted wood. 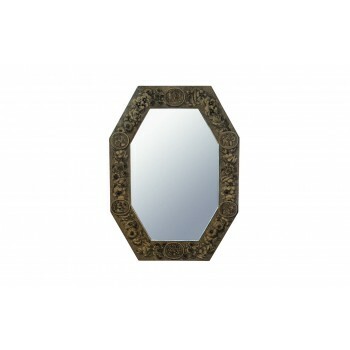 Produced by Fornasetti, Circa 2000, Italy. Interior of the top drawer with plastic rounded impressed with logo "FORNASETTI/MILANO. "Measures: Height: 84 cm, length: 101 cm, depth: 55 cm. Piero Fornasetti, pair of doors of a cupboard made for a private custode, wood decorated with trompe l'oeil pattern, circa 1950, Italy. Measures: Height 135 cm, width 158 cm, depth 3.5 cm. Piero Fornasetti (1913-1988), Piedestal, "Pyramide humaines", Wood lacquered and steel foot, signed under the top FORNASETTI MILANO (logo), Circa 1960, Italy. Measures: Height: 80 cm, diameter: 115 cm. Piero Fornasetti (1913-1988), Luster "Piovra Marina" model, Métal (parcel-gilt, lithographically and transfer-printed), Circa 1950, Italy. Measures: Heigth: 55 cm, diameter: 66 cm. 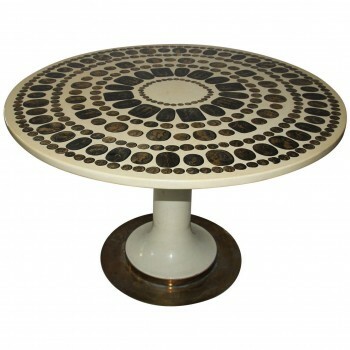 Piero Fornasetti Table, Circa 1990, Italy. Piero Fornasetti Table with antic medallions, Metal polish screen printed and colorful decor with applications of gold leaf, Production Fornasetti, Circa 1990, Italy. Measures: Height: 75 cm, diameter: 115 cm. Piero Fornasetti (1913-1988), two columns, Enamelled metal, Atelier Fornasetti, Circa 1950, Italy. Manufacturer's label. Height: 130 cm, base: 13 cm x 15 cm.